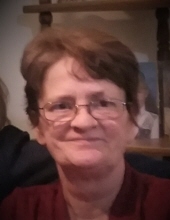 Jackie L. Verran, age 62, of Mio, formerly of Lapeer, died Tuesday, January 22, 2019. She was born April 10, 1956 in Flint, to Jack and JoeAnn (Fick) Verran. Ms. Verran attended Lapeer High School. She was a finisher at Kay Automotive Graphics and M.S.P., she liked her job and worked hard at it. Jackie was a quiet person, loved her routine, was very organized and everything had its place. She enjoyed crocheting, crafting, crossword puzzles and playing Yahtzee. Jackie especially loved playing cards, she was a competitive player, who played to win! Above all, Jackie was a loving mother and “big sister” to her siblings. She was always there to care for, comfort, defend and protect her family. Jackie is survived by her daughter: JaVon (James Sanders) Marshall of Mio; granddaughters: Jaylynn VanLacken and Samantha Marshall; sisters: Jill (Bo) White of Attica, Joy (Larry Swantek) Schultz of Lewiston, Jody (Rick) Davis of Lapeer and JaNel (Rodney) Hornung of North Branch; and several nieces and nephews. She was preceded in death by her longtime companion: Rich Cargill; parents: JoeAnn and Jack Verran; and brother: Jeffery Verran. "Email Address" would like to share the life celebration of Jackie L. Verran. Click on the "link" to go to share a favorite memory or leave a condolence message for the family.